If you look online you will find a lot of information on storing bulbs. Some of it is great information; some of it is complete misinformation. It is actually rather shocking at how much varying information there really is on the topic, so why don’t we take a few minutes and sort through it here. The first thing that you need to know is contrary to what a lot of other websites say, tulips are in fact perennials, so they CAN be left in the ground over the winter, even if you live in a place where the ground freezes up. Perennials have been growing in the wild long before man ever had the first thought to dig them up, so don’t worry, Mother Nature takes care of her own. Storing bulbs outside of the ground is optional, unless you have a specific reason for doing so. Tulips will do quite well if left in the ground year after year, provided every so often you dig up the mass of bulbs, thin them out, and replant them. This is only needed every few years so it’s not a lot of work. 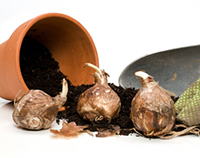 One thing to note however is in order for your tulip bulbs to survive the winter; they must have time to root first. 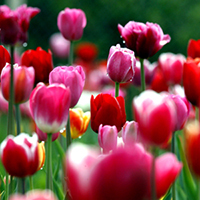 Since tulips are typically planted in the fall, make sure you give them about six week’s minimum time in the ground, before the freezing temperatures come. If you don’t, you may not see them again next year. Tulips are spring flowers, so as soon as the cold weather gives way to moderate temperatures, one of the first plants you will see pop out of the ground will be the tulips. If you are concerned about splitting up your plants, or storing bulbs for a later planting, hold your horses, you’ve already missed your chance! Spring time is not the time to go digging them up, so wherever they are, your best bet is to leave them to grow and worry about digging them up later. Enjoy the blooms while you have them! Tulips are some of the most stunning flower bulbs out there, but it always seems like their blooming period is so short. So enjoy it while you can. Once they are done blooming the flowers will die off, but the plant isn’t done yet. It is still not time for storing bulbs. During the summer months the bulb needs time to collect nutrients for the following year. It does this through the leaves still left on the plant. Many people will cut back the foliage, thinking the plant is done and ready to go dormant. Nothing is further from the truth. Tulip bulbs do not go dormant until the fall, so make sure you let the leaves on the plants through the summer to promote growth for the following year. Once the leave of the plant turn yellow, then you know the bulb has collected all the nutrients and it is ready to be dug up. 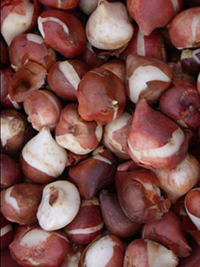 Storing tulip bulbs is really only required if you purchased them early in the year and need to wait until the fall. 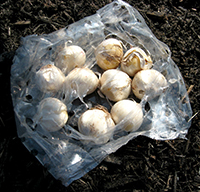 If this is the case, you will want to bag up your tulip bulbs in a paper bag where they will “breathe” and hopefully stay free of mold. From there you will want to store them in a cool, dry location. It is a common logic that storing tulip bulbs in a refrigerator is essential. This is not entirely true. Tulip bulbs do need to go through a period of cold in order to complete the dormant cycle of their life, but that is not to say they need to be exceptionally cold or frozen. If they did, tulips would never survive in warmer climates where the winters are temperate. Most underground basements will keep a consistent temperature sufficient for storing bulbs. The only thing you need to worry about is too moisture. Remember, we said a DRY, cool place. Too much moisture will lead to mold and rotting of your tulip bulbs, and that defeats the whole purpose of digging them up in the first place. You can certainly store your bulbs in a refrigerator, but make sure there are no fruits or vegetables in there with them. Fruits and vegetables give off a type of gas that actually will kill the bulbs over time. You don’t want to go through all the trouble of storing tulip bulbs, only to find them dead when the fall comes around. When to Plant Tulip Bulbs: As we said before, tulips are best planted in the fall around September or October for most areas, where the bulbs have a good six to eight weeks of rooting time before the freezing temperatures come. 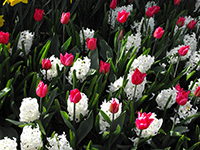 You’ve taken great care in storing bulbs for this moment, don’t wait too long to get them in the ground. You will want to choose a spot with as much direct sunlight as possible. Dig a hole around 4 to 5 inches deep for planting. It is always a good idea to cover the bulbs with a nice thick layering of mulch too. Mulch will help retain moisture in the short term, and also act as an insulator during the cold winter months. If you have taken good care of your tulip bulbs in the off season, you can expect to see nice vibrant growth early the following spring. The advantages to storing tulip bulbs outside of the ground is it gives you the opportunity to look at the bulbs and divide them up according to size, if you would like to replant them in similar groupings in the fall. The other big advantage to storing tulip bulbs is they are at less of a risk of rotting due to overwatering during the summer months, when you are taking care of the rest of your thirsty plants. The downside is digging them up every year is an awful lot of work, but if you are comfortable with that, you can really ensure that you end up with an absolutely stunning array of tulips.